Overview of famous ice cream parlours in Florence. Florence is known in Italy and beyond for good ice cream. There are some homemade ice cream parlours, which are also very popular among the locals. Often long queues form in front of the famous ice cream parlours. In some of them there is even a lot going on in winter. Ice cream parlour is called „Gelateria“ in Italian. Ice cream means „Gelato“. It’s important to know: In Italy, the price of an ice cream is not calculated according to the number of balls, but according to the size of the cup or waffle. There are also no balls, the seller uses a kind of spatula. The smallest cups usually cost around 2 euros.. You can always choose several sorts in one cup or on one waffle. With the smallest cup these are usually maximally two flouvers, with larger ice cups substantially more. However, some Italians simply take a large portion of their favourite ice cream. As in many country, you can choose between a cup with a spoon or a waffle to lick in every ice cream shop in Italy. The price is usually the same. In many good ice cream parlours the ice cream is made homemade. Some ice cream parlours in Florence and throughout Italy are rightly proud of their own ice cream. It tastes fresher and better than anywhere else. Only fresh fruit from the region is used. Some types of ice cream are therefore not available in some ice cream cafés in winter. In the following we would like to introduce some of the ice cream parlours in Florence that are well-known and, in our opinion, offer an exceptionally good ice cream at affordable prices. In summer, long queues often form in front of these shops. But queuing is worth it. 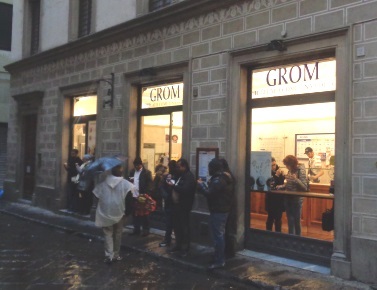 In the meantime, the Grom, not far from the world-famous cathedral of Florence, is one of the most popular ice cream parlours in Florence. The Grom is proud to buy only the best ingredients. As far as we know, only natural ingredients are used and no colourings, flavourings, preservatives or the like. In the ice cream are the best fruits, preferably from the region. It was the first time that we consciously went to a well-known ice cream parlour in Italy. It was really worth it: the ice cream tasted great. Especially the taste of the pear ice cream after fresh pears was great. 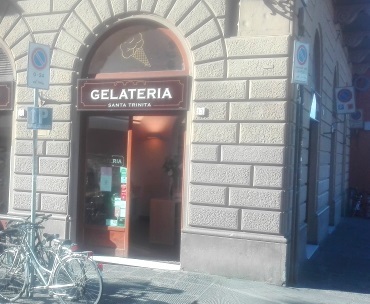 The Gelateria Grom in Florence is near the cathedral. From the cathedral square you walk down the street by the bell tower. This street has the simple name „Via del Campanile“ (Street of the Bell Tower). After 30 meters you are at the ice cream parlour Grom. The queues in front of the shop are often visible in advance. 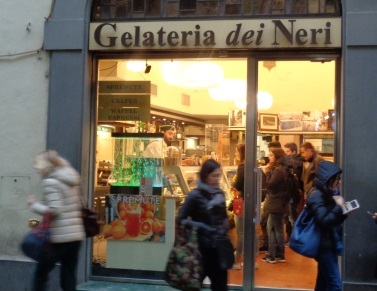 The Gelateria dei Neri is also one of the 4 to 5 ice-cream parlours that almost every inhabitant of Florence knows. It is located in the city centre in a small side street. The name of the ice cream parlour and the street (Via dei Neri) are identical. In the small alley there are also some good and inexpensive restaurants, especially the inexpensive and rustic „La Fettunta“ with classic Tuscan cuisine (lots of meat). As usual in Italy, you can choose several flavours or just one in one cup. 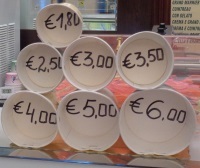 In Florence you always pay according to cup size and not according to the number of flouvers.. The Cafe dei Neri also sells cakes. Smaller whole cakes cost to take away partly clearly under 20 euros, very favorable for Florence. The staff in the Gelateria dei Neri is nice and in a good mood. The ice cream parlour dei Nero is really worth a visit. Caution: long queues in summer at certain times of the day. Two other well-known ice cream parlours in Florence are seen from the old town on the other side of the river Arno in the Oltrarno district. Both are immediately after a bridge over the great river in Florence. Both have the same name as the bridge. We have tried the varieties coconut (Cocco) and wild berries (Frutti die Bosco). Interesting ice cream varieties on the long menu include Cream Caramel, After Eight, Black Cherry and Mantel Milk. There are also varieties with very simple names such as milk ice cream or yoghurt ice cream, certainly worth a test. The lady who served us was very nice and answered our questions in detail. 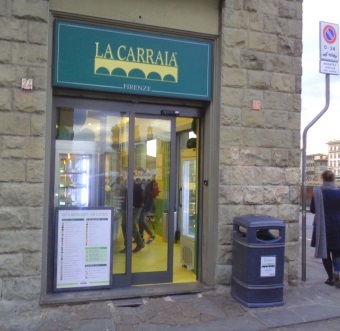 In the Gelateria La Carraia ice cream parlour you can sit down on benches and enjoy your ice cream. The bridge Ponte La Carraia is in the center of Florence and about 500 meters or two bridges north of the Ponte Vecchio. Another Arno bridge closer to the famous Ponte Vecchio is the Ponte Santa Trinita. Also here is an exceptionally good ice cream parlour right next to the bridge on the southern side of the river Arno. It is again named after the bridge: Gelateria Santa Trinita (translated as „Holy Trinity“). 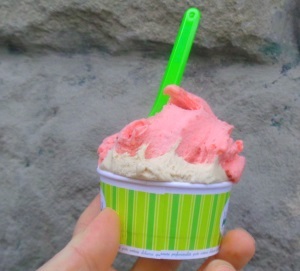 This was an overview of four great ice cream parlours in Florence, which we know and like. There are many hundreds more. Many of them certainly offer excellent ice cream in cups and waffles as well. Florence is for us something like the ice capital of the world.